The second season of the Bajillion Dollar Propertie$ TV show premieres on Seeso, Thursday October 13, 2016. The semi-scripted high-end real estate spoof comedy series stars Dan Ahdoot, Tim Baltz, Ryan Gaul, Mandell Maughan, Tawny Newsome, Drew Tarver, and Paul F. Tompkins. Guest stars in Bajillion Dollar Propertie$, season two, include: Zach Galifianakis, Nick Kroll, Busy Philipps, Casey Wilson, Jack McBrayer, Patton Oswalt, Paul Rust, Randall Park, Dave Foley, Weird Al Yankovic, and Madison Hildebrand, from Bravo’s Million Dollar Listing: Los Angeles. Watch a short and get the details from this press release. Enjoy this Bajillion Dollar Properties digital short, from Seeso. NEW YORK – September 7, 2016 – Fan-favorite “BAJILLION DOLLAR PROPERTIE$” will return to Seeso for season two on October 13. The second season of the half-hour, semi-scripted comedy set against the backdrop of a luxury, cut throat LA real estate firm, will feature comedy greats: Zach Galifianakis (“THE HANGOVER,” “BETWEEN TWO FERNS”), Nick Kroll (“THE LEAGUE”), Busy Philipps (“COUGAR TOWN”), Casey Wilson (“HAPPY ENDINGS”), Jack McBrayer (“30 ROCK”), Patton Oswalt (“BOJACK HORSEMAN”), Paul Rust (“LOVE”), Randall Park (“FRESH OFF THE BOAT”), Dave Foley (“THE KIDS IN THE HALL,” “DR. KEN”) and Weird Al Yankovic (COMEDY BANG! BANG! ), among others. Additionally, Bravo Media’s “MILLION DOLLAR LISTING LOS ANGELES” star Madison Hildebrand will make an appearance in the upcoming season as himself. Season two picks up right where season one left off – a partner has been chosen, but what comes next? Find out October 13. 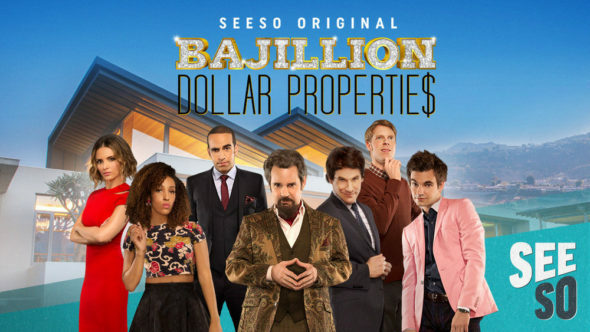 To catch up on the first season of “BAJILLION DOLLAR PROPERTIE$,” sign up for Seeso. What do you think? Did you watch the first season of the Bajillion Dollar Properties TV series? Do you plan to tune in for the second season on Seeso? Tell us. More about: Bajillion Dollar Properties, Bajillion Dollar Properties: canceled or renewed?